Shayna Earnest teaches math and science, often using creative projects, at Gordon Bernell on the ABQ JobCorps campus. To enter the Job Corps campus in Northwest Albuquerque, you pass through a remarkably friendly security checkpoint. Job Corps is a federally funded, tuition-free residential program for people 16 to 24 years old. "We’re heading toward the Gordon Bernell Charter School that’s based inside the Job Corps campus," explains Chris Pauls, the Dean of Students at Gordon Bernell here. "So it’s sort of a school within a school." He points out the dorms, the rec center, and buildings where Job Corps members learn trades like welding, plumbing, and office administration. "And then that building in the far distance, they have another online high school there." Albuquerque Job Corps students working toward their high school diploma have access to two virtual programs, James Madison High School and Penn Foster High School, with on-site assistance from a licensed ESL/ELL instructor. Inside Gordon Bernell’s small building, Pauls says, it’s all about working with students individually, "because they come to us with a variety of credits, a variety of experiences in school and stuff like that." Gordon Bernell Charter School serves about 430 students across several locations, including inside the Bernalillo County Metropolitan Detention Center. It’s unique among New Mexico public schools in that more than two-thirds of its students are adults, so when lawmakers voted earlier this year to stop funding public school students over the age of 21, students and staff were alarmed. After weeks of advocacy, Gordon Bernell was given another year to continue operating as is, and a promise of more funding from the state’s higher education budget in the future. The details of that future funding scheme are still unclear, according to school administrators. "This is a video of the most recent project my students did," says Shayna Earnest, who teaches math and science. She hits play and we see a ball drop onto a chute. Her students learned about the cartoonist Rube Goldberg and his famous elaborate machines – you know, a boot drops and kicks a football, which lands in a basket, which pulls a lever... – well, her students made their own chain reaction machines. 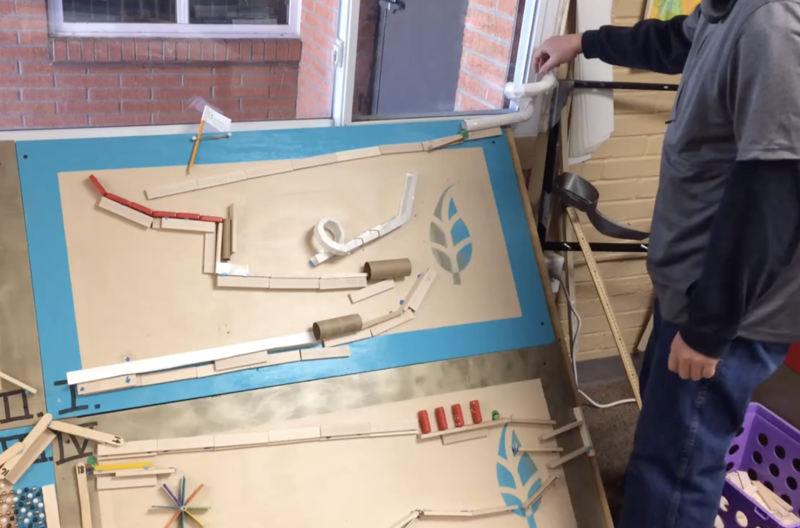 A student tests their Rube Goldberg-inspired machine. "They are talking about these scientific concepts," says Earnest, "like, I think if we adjust the angle over here, the ball will roll faster,' so it really just creates this excitement that really can’t be re-created in any sort of online or GED program." Sitting nearby is 20-year-old student Christopher Lemons. "This is kind of like a second chance for me," he says. He went to two different big high schools in Albuquerque, and dropped out after his grandmother had a stroke. But he says his struggles in school go way back to something that happened to him when he was a baby. "See, I’ve had a frontal lobe disability since I was three months old," Lemons said. "Me and my mother, we were tail-boned by a driver who wasn’t paying attention, and I hit my head against the back of my mother’s seat." The brain damage affects his memory, Lemons says, and his ability to understand instructions. It’s been tough to get the support he needs in school. "When I was at my other schools, I’d sit there for a good ten, twenty minutes, just sitting there raising my hand trying to ask for help," said Lemons. "But I’ve never had problems finding help here. [The staff are] very kind, they treat each and every single student with the same amount of respect." Lemons says his special education teacher has been especially helpful. Gordon Bernell also has clinical social workers and counselors who work closely with students to try to meet their academic and social-emotional needs. On a good day at school, Lemons is studying history – his favorite subject. "I like to see back on what’s different between back then and how it is now," he said. "I’d rather go out, see what it was like in different cultures around the world. That's what I mainly want to do." After getting his diploma, Lemons plans to study anthropology at Central New Mexico Community College. So much of his youth was defined by one moment in his past, but with the right kind of support, he hopes someday he’ll write his own history book. Correction: This story has been edited to reflect that the online high school programs at Albuquerque Job Corps are staffed by a licensed teacher. Lots of people don’t vote because they don’t see candidates they identify with or they don’t think their vote counts for much. KUNM spoke with a student who's got a lot on his mind, including felony charges and an upcoming trial date. Even so, he says he’s getting informed and getting to the polls for the first time this election.